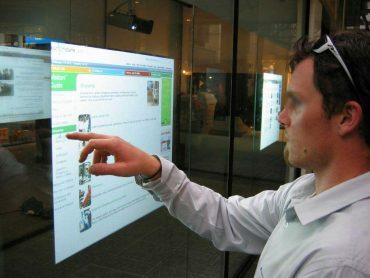 Touch screen public display applications are becoming an essential component of any building lobby or commercial space. You’ve probably already encountered public display software at your local shopping mall or when visiting a public building. Those screens are mainly used for wayfinding and information kiosks with interactive content delivered in HTML, HTML5 and Flash. We support all forms of interactive content natively. There is no need to convert anything. QL Player is available on Microsoft Windows and Google Android versions. PCs, media player devices and tablets are all supported. QL Spy can be used to trigger any QL managed content or launch third party software. After a specified period of inactivity, QL Player is automatically brought back on screen so you can show scheduled advertising or entertainment content. With QL Trigger API, Launch any content for touch screen public display based on movement or user interaction through Microsoft Kinect, RFID, motion sensors and other devices. Interactivity is not restricted to kiosks. Create compelling audience experiences by combining QL Player with Microsoft Kinect. Let the audience select content based on arm movement or other body motion. Invite potential users to touch the screens and interact with available content. Involve users by providing them with dedicated control of interactivity content. Turn your touch interactive screens into regular digital signage displays. By triggering Navori Spy, you determine the appropriate timing when to launch a regular playlist on your unused touch screen.